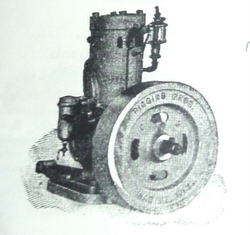 A 1902 advertisement for an early Piggins Brothers two-cycle marine engine was reproduced in 2006 on the Old Marine Engine Enthusiasts website and indicates that the firm was already considering making automotive engines by that stage. The text reads: "The Two-Cycle Type From 1 to 6 Horse Power with steel shaft; all bronze bearings; pump; platinum sparking points, and other good improvements; all water-jacketed head; special engines built to order, either steam or gasoline, for launches or carriages. Also complete launches. Agents wanted. Piggins Bros., Racine, Wis."
Collector Dan Dorece has exhibited online what is now believed to be a Piggins Brothers single-cylinder, two-cycle engine produced for the Racine Boat Mfg. Co. 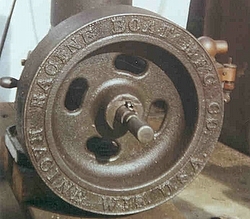 Although that customer company's own name is cast in relief on the flywheel, Racine Boat may have obtained its engines at the early stage from external suppliers such as the Pigginses. 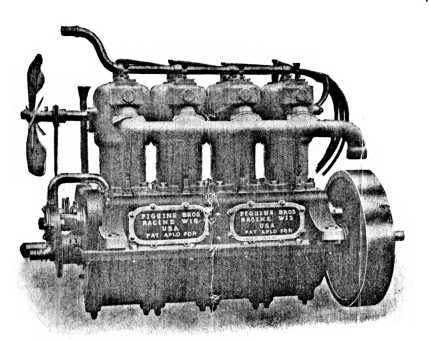 The Dorece engine does not appear to resemble those made by Racine Boat at its Muskegon, Michigan plant from 1903 and illustrated in detail in that company's 1904 patent. 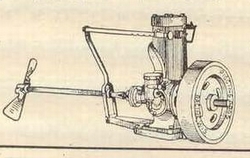 There are several extant pictures of Piggin Brothers' four-stroke petrol engines as well as schematic patent drawings that explain one of the main principles of their operation, the pre-warming of the explosive mixture. 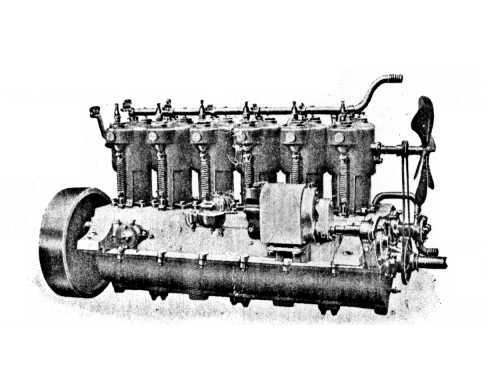 These T-head-type engines operated on the familiar Otto cycle, which continues to be the dominant technology for petrol engines today, and their principles are therefore relatively easy to understand, despite their unusual form factor, with the cylinders cast as separate items. This may have been a modular manufacturing idea, reflecting the emergence of the design from marine-engine practice, where motors must be repaired in situ, but also catered to the need to make six-, four- and two-cylinder versions easily. A two-cylinder version is mentioned in the trucks brochure though no images of this survive. The Brothers most likely used a local Racine foundry for the castings and they defended this principle as a way of simplifying engine maintenance. The smaller size of single-cylinder castings would no doubt have reduced their costs. But the very small number of engines they would have made probably meant the unit cost was quite high, and the trend was in another direction. The industrialist Henry Ford in Detroit had already begun making an en-bloc motor, with all the cylinders cast in one metal block, for the Ford Model T, a design which prevailed within a few decades. The four-stroke engines were decorated with company plaques on every pair of cylinders. These name plates read: "Piggin Bros Racine Wis USA Pat Apld For". US patent 898 678, when granted, was for the engines' unusual combination of internal passageways, and this is described in detail on a separate page on this website. To date, it has not been established precisely what kind of gearbox was used in the Piggins car or trucks, though the trucks brochure states: "All gears are enclosed and run in grease, all bearings run on balls, from the wheels to the clutch in engine." The trucks had "burn-proof" leather clutches and "selective" gears, with three forward speeds and one reverse.